I was given accomodations to Nevis Island, however all opinions are my own. Nevis Island is one of the best Caribbean destinations I have ever had the pleasure to visit. 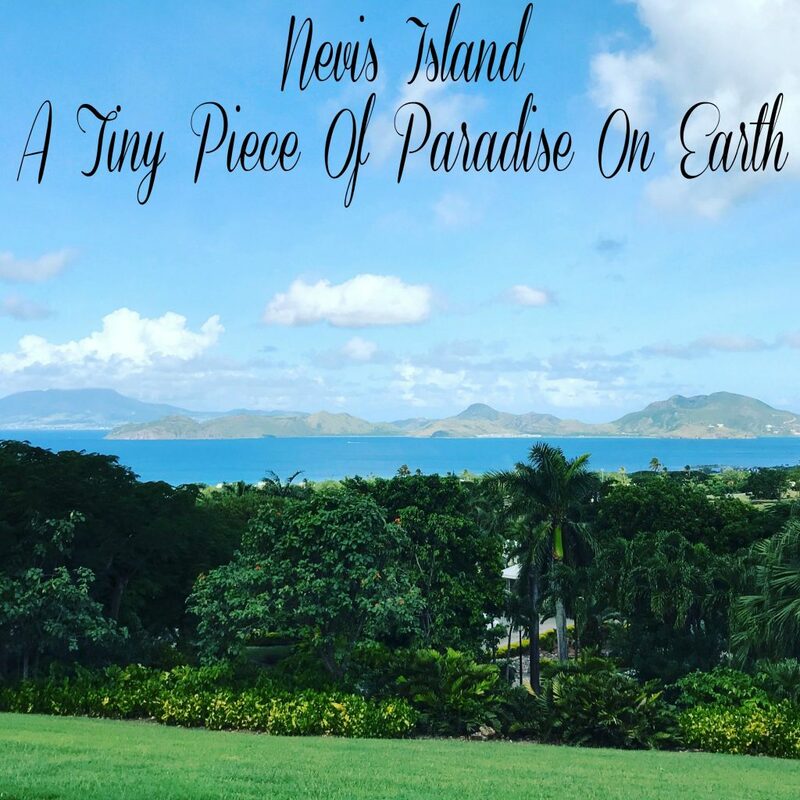 Not only is it a true piece of paradise but there was so much I didn’t know about Nevis! Check out my top ten highlights about the Island. Where In The World Is Nevis Island? 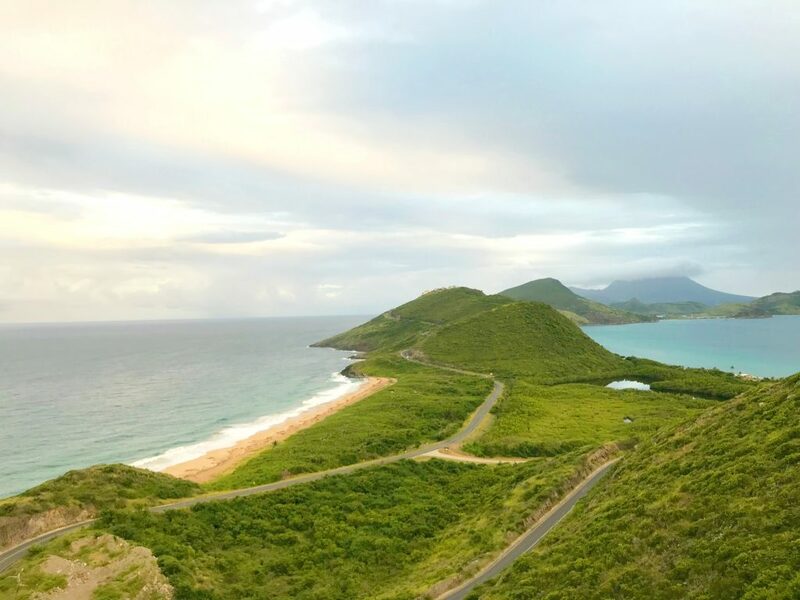 When I received an invitation to visit Nevis Island, the first question my husband asked was: “Where is Nevis Island?” My reply was simple, “It’s in the Caribbean right next to St. Kitts, duh!” OK, I may not have added the “duh” to my reply but I replied like he were suppose to know. 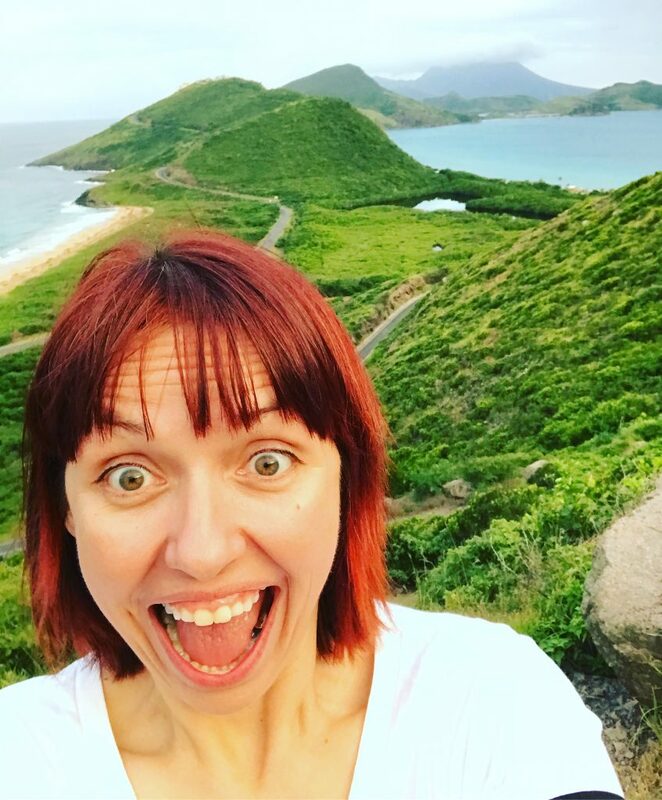 Truth is, when I first received the invite to visit Nevis Island, I had to Google the location myself! Nevis Island is part of the Federation of Saint Kitts and Nevis and is the smaller and more remote island of the two. In fact to travel to Nevis, one must first fly into the St. Kitts airport and take a boat to Nevis Island. 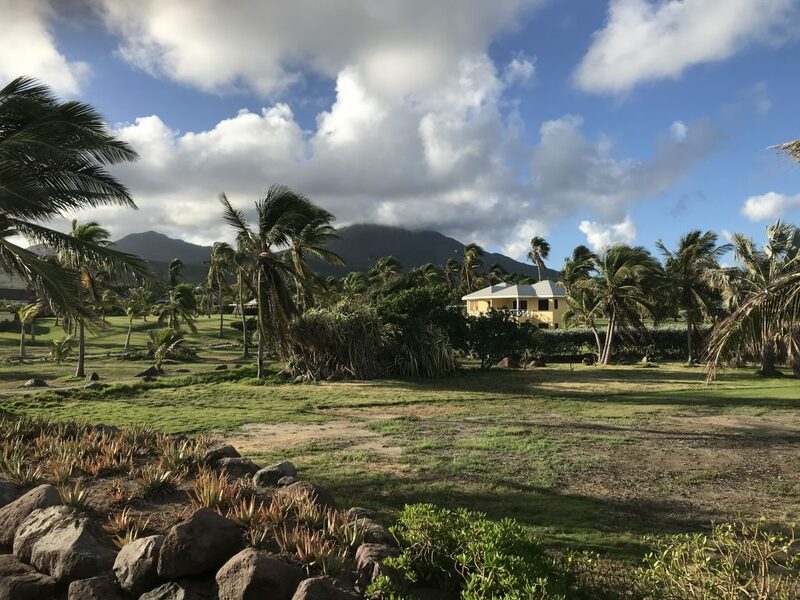 Nevis does not have a major airport nor do cruise ships stop there, this “remoteness” is part of what gives Nevis its charm. The second question I received, after I informed everyone that Nevis Island is located in the Caribbean was, “Wasn’t all those islands destroyed in the hurricanes this summer?” NO! While the hurricanes came extremely close to Nevis, missing it by 1 degree, Nevis received very minimal damage and is standing strong. John Cottle was a lawyer, the President of Nevis, a planation owner and a slave owner. In 1824 he opened an Anglican Church, now called “Cottle Church” in which everyone was welcome, including slaves. 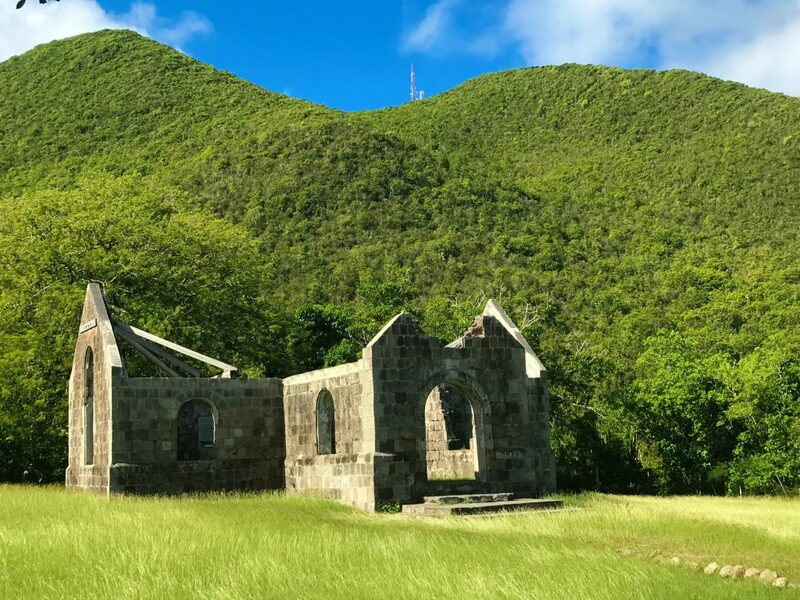 The ruins of this church still stand on Nevis today and is a popular tourist attraction. Plaques, which lists the names of the members of the church still grace the walls of the church. It’s also used as a great location for wedding photos. Lin-Manuel Miranda, creator of the the huge Broadway musical ‘Hamilton’, understood the importance of visiting Nevis. In fact, he made a trip to Nevis Island before the musical even hit the stage to experience the island in which Alexander Hamilton was born and lived until the age of nine. 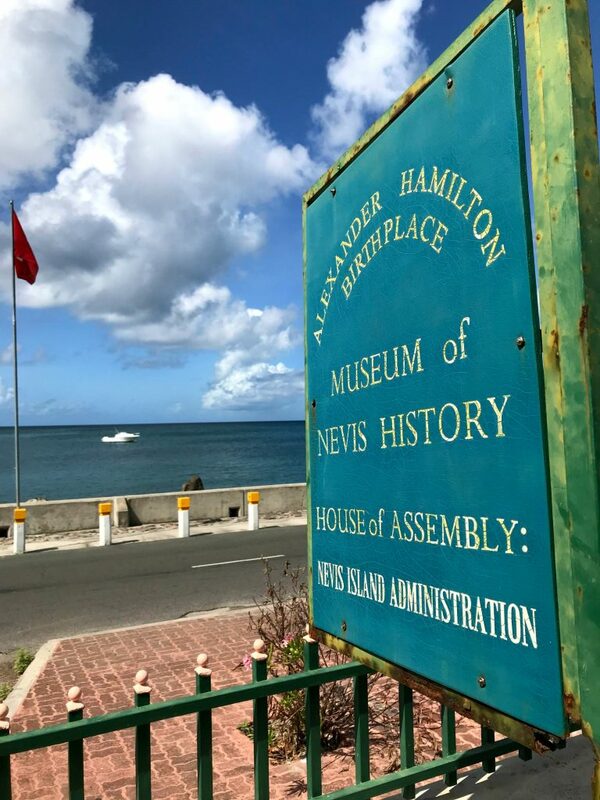 The Museum of Nevis History is actually on the spot of the home Hamilton was born in. Although the original house was destroyed in an earthquake in 1840, it still has the original steps which were part of Alexander Hamilton’s home. From Princess Diana to Queen B (Beyonce), Nevis is a popular vacation spot for many royals and celebrities. 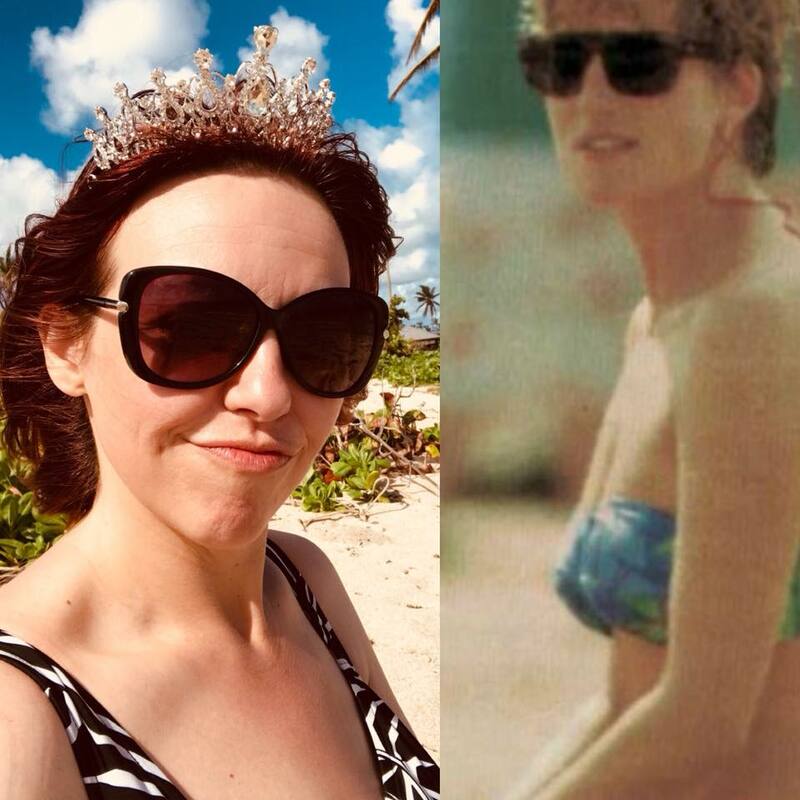 If you ask a local if they’ve ever met a royal or celebrity on the Island, I can bet 1 out of 2 have a story to tell. I was shown pictures of Prince Harrys visit to Nevis last year, where he actually touched the hand of the lady I was speaking with and she had the photo to prove it! Lucky! And when asked about some of the favorite celebrities which have stayed at the Four Seasons, memories of Whitney Houston having an impromptu mini concert (singing a song or two to the workers and guests) on New Years Eve brought a tear to my eye. The beauty and remoteness of Nevis is definitely a “seller” for such a famous crowd. 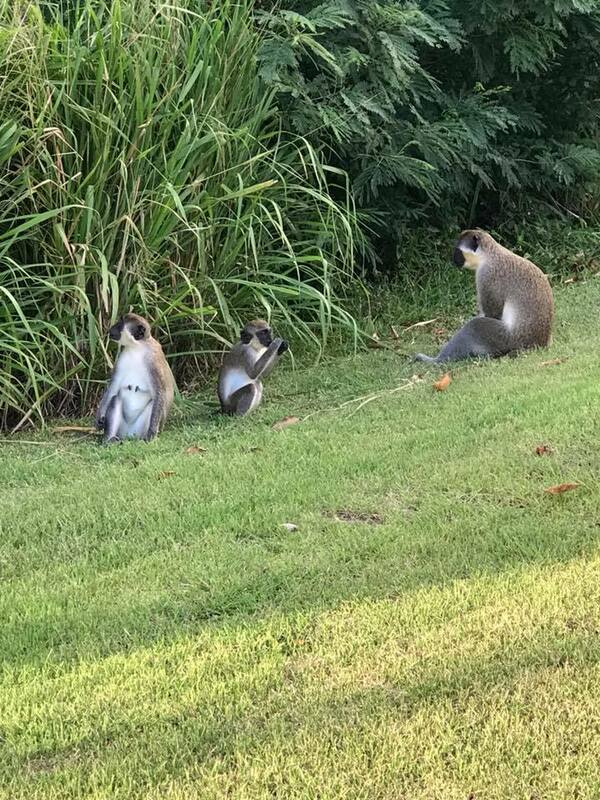 You can be sure to see a monkey or two while visiting Nevis and the locals will offer one up to take home with you! It has been said, but not proven, that the Monkeys on the island outnumber the residents on Nevis. I would’ve never guessed this, as hard as I had to search to get a picture of the monkeys but in the more “jungle-like” areas in Nevis I found tons of them! The monkeys like to sneak around at night/early hours of the morning and forage for food. It is suggested to not feed them because residents don’t want them becoming too comfortable. You don’t want a brave monkey foraging for food right out of your hand, now do you? 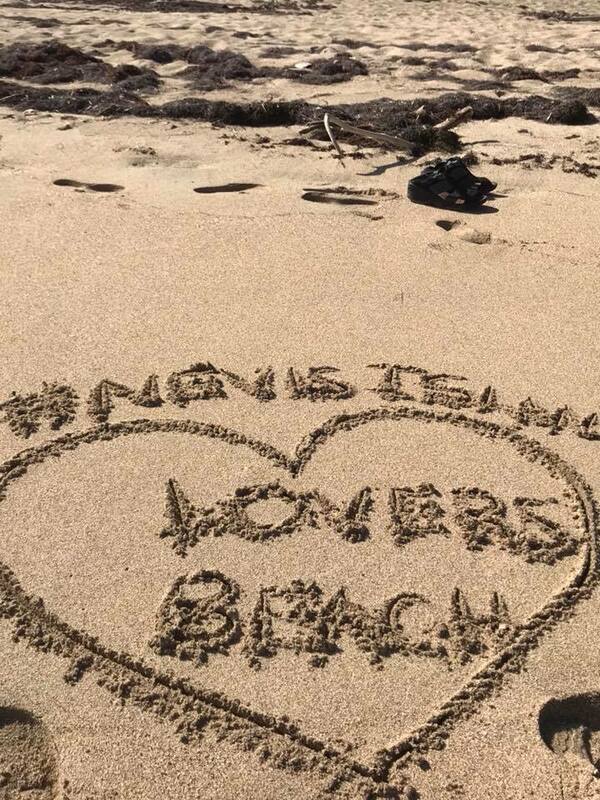 Nevis is a small island afterall, so you will find beautiful beaches everywhere! But one beach in particular, Lovers Beach, has been named the 3rd most secluded beach in the world. The beach got its name because many couples like to spend time there, hence the name “Lovers Beach” In fact, as we took an ATV ride to reach the beach, we passed a couple hand in hand just leaving. It was quiet the romantic scene. I don’t think I’ve every drank so much rum in my life than I did while visiting Nevis. My first rum punch on the Island was actually on the boat from St. Kitts TO Nevis Island and the rum did not stop there. Many of the popular destinations on Nevis seem to have their own popular type drink, many including rum. 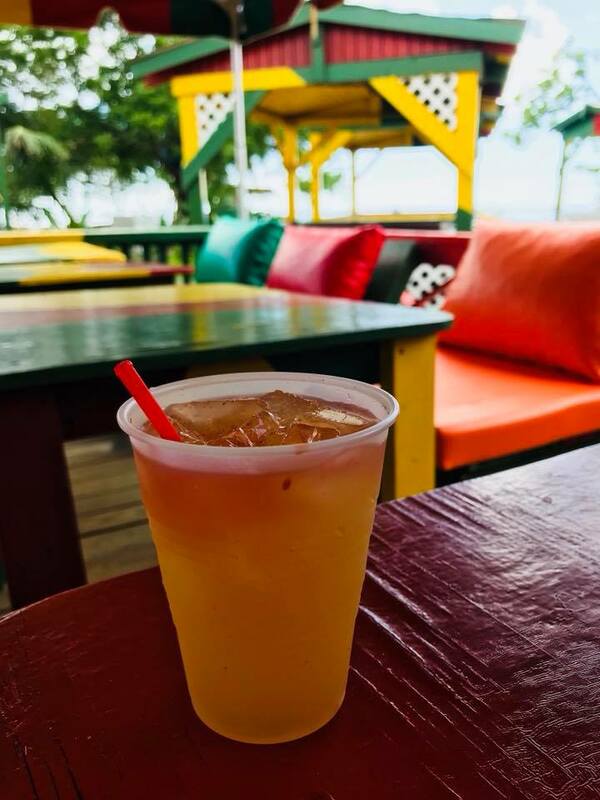 You can find the “Famous Killer Bee” at Sunshine’s and even the “Best Rum Punch Ever” at The Hermitage. I know, I know, rum runs plentiful in the Caribbean but it seems Nevis puts it’s own special twist on the beloved spirits. If you know anything about me, you know first and foremost, I am a foodie. I particularly enjoy my sweets but I love all food. I have to admit, I was a tad bit nervous about the food on Nevis. I may have been a little naive but I pictured a small island not having much variety in dishes. Seafood, all I pictured was seafood. And after visiting other Caribbean Islands, I remember encountering very very spicy hot food which I am not a fan of! Let me tell you, I was taken aback by the fine cuisine on Nevis! My tastes buds salivate as I remember the melt in your mouth ribs at The Gin Trap, the Conch Mac and Cheese at Banana’s Bistro and the Grilled Tuna at Sunshine’s; the food is amazing! 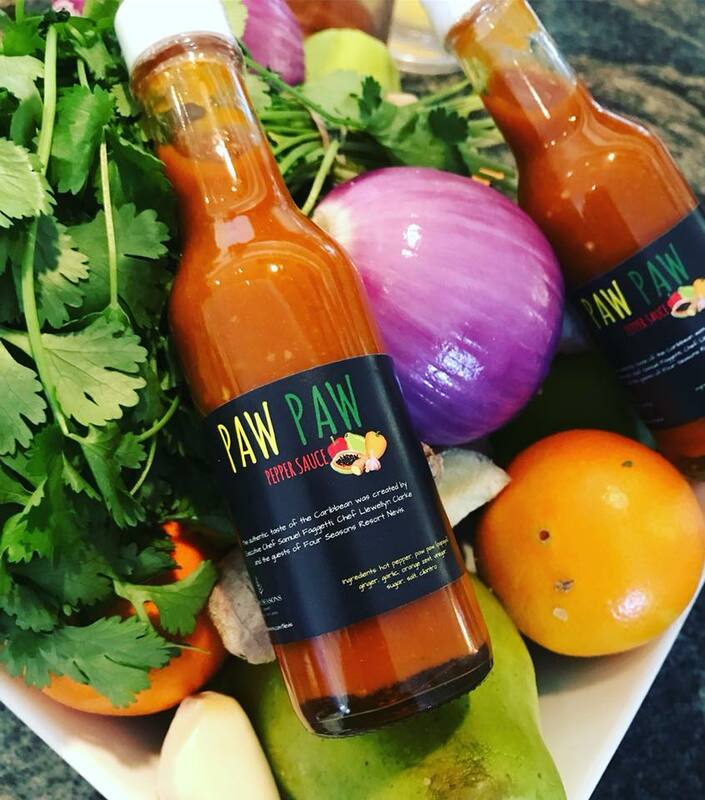 Even Llewellyn’s hot sauce, which you will find all around the island, is world renowned! The beauty of Nevis Island is striking, it is definitely a huge factor which draws one to visit, it is a true paradise on earth. However, the biggest factor which will have one yearning to return are the local residents. They say you are only a stranger to Nevis once and this I learned to be true. The people I met on Nevis, whether is be someone I was formally introduced to or a random person I crossed pathes with, greeted me with a geniune smile and made me feel at home. At any time I was needing assistance whatsoever, residents and workers went above and beyond to help. And if I did happen to cross their path again while visiting, I was greeted like a life long friend. Now that I’ve returned home and reminiscing on my time at Nevis, I feel extremely grateful to have had the opportunity to experience such a paradise and will one day return, old friend.